Emotional toll, I pour 100% of myself into these things. Im usually "good" for 3-4 months, then I get sidelined with an injury for a month. My right leg hates me. We need to become BFFs fast! I get consumed by the marathon. The last 3 have not gone as well as expected. I might not be cut out for this distance. Need to remain healthy for a period longer than 4 months. And mainly, Just run for fun. For the enjoyment, not because I have an 18 miler on the schedule. So this morning while I was still groggy, I received a phone call from WW who is overseas for a business trip. He told me he registered for the Chicago marathon. I was shocked, surprised and speechless. Just a week ago I had asked him if he wanted to run it this year (like I have done the past few years). He was a very absolute NO on the matter, so I didn't bring it up again. (He travels a lot, so training wouldn't be the 1st thing on his mind- especially after a 10 hour flight) . This morning's phone call made me so happy and proud. I even asked him 5 times if he was serious or joking around with me! Apparently registration is filling fast. After a week they were 2/3 full- on a crazy pace to sell out in record time! So even though I'm eating my words of the "No marathon" 2012, This is an experience I absolutely cannot miss out on. I get to "Pay it forward" Much like how Tribu got me through Miami, in the heat and with an injury, I will be WW's Cheerleader, to help him cross the finish of his first marathon! We will "bond" over running. WW has been with me through all of the Ups and Downs that running/ training has brought me over the last few years- while I transitioned from recreational runner to "I am hungry for a PR runner." By far, my WW has been my biggest supporter-cheerleader, even standing out in the cold rain to cheer me on. I will be the biggest cheerleader for him. Im so excited for his journey! I still want my BQ, but that might have to wait until next year. Perhaps if i'm still going strong and healthy by June, I'll re-consider my "NO MARATHONS" and attempt a BQ in September. At least with this marathon you have a good amount of recovery time before training starts. You guys will have a wonderful time training and racing with each other. That is awesome! I am so happy for you and WW! YAY! At least the pressure will be removed for Chicago and you can have fun! Last night as I was laying in bed my mind wandered to that place...to do Chicago ONE. MORE. TIME. Then I remembered having to do long runs in the oppressive heat and humidity here in SE Texas. You were practically forced into registering for the marathon really :). 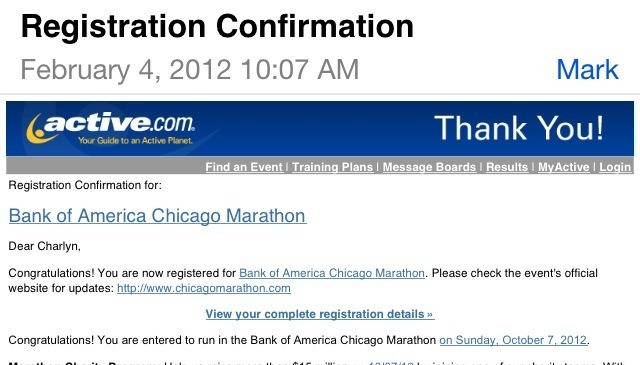 I'm not going to lie...when I saw the announcement for the 2012 Chicago marathon part of me wanted to run it again too, but I'm not as crazy as you afterall! YAYAY so excited about you signing up for Chicago! yay to no absolutes! i am excited for ya'll it will be a blast! stu is planning to run his first full this fall - it should be fun times to train together!